Not only is Honningsvåg church the main church in the Northcape parish, it is also the oldest building in the town of Honningsvåg. You are most welcome to visit. 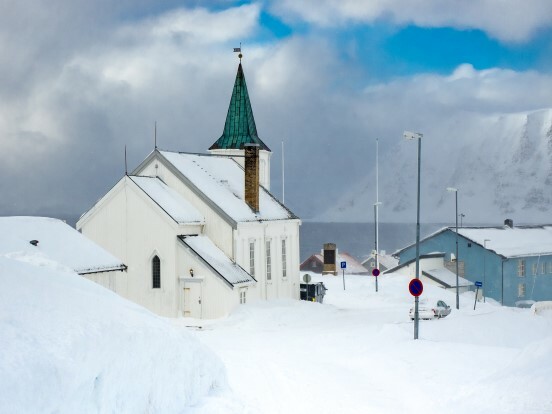 Honningsvåg Church is the main church in The North Cape parish and has been so since it was build in 1885. During the last year of World War II, the occupant Nazis, on Hitlers orders, forced the inhabitants to flee south. Then the soldiers burned down every building, bridge, pier, barn and shed all over Finnmark County. So also in the North Cape municipalty. Nothing was spared, everything was burned to the ground. Everything, but the church in Honningsvåg. Soon after the war ended, people started to return to the island to rebuild their lives. As the only standing building, the church was then used as living quarters for the first people to return. People slept in the benches and on the attic, baked their own bread in the owen inside the church, and started the hard work of rebuilding the town. Honningsvåg Church is a not only a church. It is an important part of our history, and a symbol of the resistanse and determination of the people at North Cape.